Because of his background, leadership, and devotion to the ideals which the Daughters of the American Revolution hold most dear, we dedicate our chapter to the memory of Governor George W. P. Hunt. George Wylie Paul Hunt was born in Huntsville, Missouri, on 1 November 1859, to George Washington Hunt and Sarah Elizabeth Yates. Able to obtain only an eighth-grade education, he left home in 1878 to seek his fortune, traveling through several states before arriving almost three years later in his new hometown of Globe, Arizona. Leading a burro loaded with all his worldly possessions, Hunt was like many others of his time who had come in search of one thing: gold. After working at a variety of jobs, Hunt was hired by the Baily Store in 1890, and by 1900 he was its president. On 24 February 1904, Hunt married Helen Duette Ellison, the daughter of Jesse W. Ellison and Susan Melvina Smith, pioneers who had come to Arizona from Texas. The following year after their wedding, their daughter, Virginia, was born. Always interested in politics, Hunt was elected treasurer of Gila County in 1893 and was the first mayor of the town of Globe. He went on to serve in the territorial legislature and was selected to the Constitutional Convention of 1910. As its president, he oversaw the creation of Arizona as a state. When it officially joined the United States on 14 February 1912, it did so with Hunt at the helm as its first Governor. A democrat who considered himself to be a modern, progressive thinker, Hunt used his humble beginnings to gain support from the common man of the state. He fought hard for Arizona’s access to the waters of the Colorado River and insisted the state’s constitution include the right to vote for women, even though the Nineteenth Amendment granting that right nationwide would not be passed for another eight years. In May 1920, between gubernatorial terms, Hunt was appointed U.S. Minister to Siam (now known as Thailand), a position he held for thirteen months and provided the opportunity for world travel. The date palms still towering over Main Street between Mesa and Tempe were a gift to Hunt from the King of Siam, evidence of his popularity with the legendary monarch. 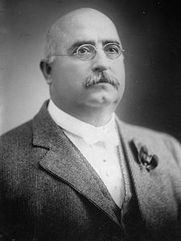 Early in Hunt’s final term as governor in 1931, his wife Helen died. Fascinated by the pyramids during a trip to Egypt, Hunt received permission from Congress to construct a white-tiled pyramid for her tomb in what is now Papago Park, as President Woodrow Wilson had set aside 2,050 acres for the Papago Saguaro National Monument in 1914. Later interred in the tomb were his daughter, Virginia, and her husband, William Frund, along with Helen’s parents and her sister, Lena Ellison. Several books have been written about Governor Hunt’s life, and his papers can be found in several collections, including: the Arizona State Archives, the University of Arizona, Arizona State University, and the Arizona Republic newspaper archives. Written by Kathryn H. McCorkle and Helen Parrish Bernhard, members of Governor George W.P. Hunt Chapter NSDAR, 2012. Governor Hunt's tomb sits atop a hill in Papago Park overlooking the Phoenix Zoo.